Sports history has been made! Transgender triathlete and nationally ranked runner Chris Mosier is the first known openly transgender athlete to join a U.S. team matching his gender identity. In other sports diversity news are Michael Sam, swimmer Justin Lynch and FIFA. Here are the details. Transgender athlete Chris Mosier has made sports history. He’ll be representing the U.S. in the 2016 World Championship Duathalon in Spain, running in the sprint duathalon category. He’s the first known openly transgender athlete to join a U.S. team that matches his gender identity rather than the one assigned at birth. A transgender rights advocate, Mosier, executive director of the non-profit GO! Athletes, a support network of current and former LGBT athletes, he is also the first transgender man to be inducted into the National Gay and Lesbian Sports Hall of Fame. 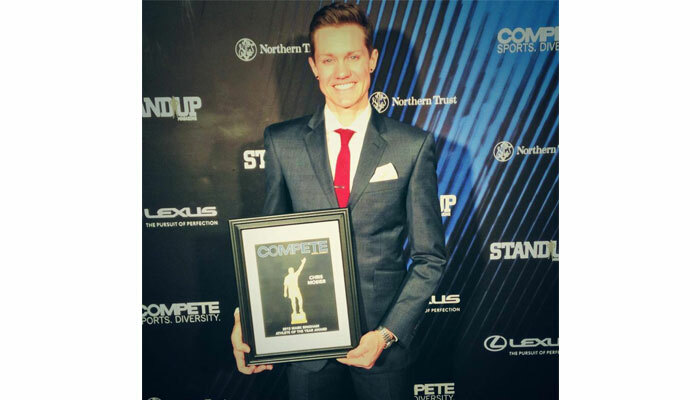 Compete Magazine honored Mosier as its 2013 Mark Bingham Athlete of the Year. Openly gay football defensive end Michael Sam has left training camp of the Montreal Alouettes of the Canadian Football League (CFL) one day before its first preseason game, returning home for personal reasons. The team issued a statement saying that “Out of respect for Michael Sam, the nature of this decision will remain confidential,” and added the fact that Sam could return. Sam has not released a statement at this time. After beating a Michael Phelps record when you’re just 14, what then? At the June 2013 USA Swimming world championship trials, 14-year-old Justin Lynch broke Michael Phelps’ age-group record in the 100 meter butterfly. Ever since he’s had his eyes set on the 2016 Olympics in Rio. In April the now 17-year-old competed against both Phelps and Ryan Lochte at the USA Swimming Grand Prix in Mesa, Arizona. While the two former Olympians took the top spots, Lynch took fourth, coming in around 1.5 seconds behind them; he’ll soon be joining Berkeley’s top rated NCAA swim team. The potential cultural impact he makes on swimming isn’t lost on Lynch, along with the impact of other top African-American swimmers, another being Cullen Jones, the four-time Olympic medalist and the first African-American to break a world swimming record. Lynch will train for the next two years in hopes of making the team for the Rio Summer Olympics. At that point he’ll 20-years-old, considered a peak age for male swimmers in the 100-meter race. FIFA, soccer’s international governing body is in the midst of an ugly corruption scandal of top administrators that is just starting to unravel. And yet, in one of the worst timings in the history of sports associations and films, FIFA launched “United Passions” a self-financed documentary that opened on June 5 as a number of its administrators were being arrested or indicted. The U.S. Department of Justice has indicted a total of 14 current and former FIFA officials and associates on charges of “rampant, systemic, and deep-rooted” corruption following a major inquiry by the Federal Bureau of Investigation (FBI). According to the BBC, “A vanity film about the history of FIFA has flopped in the U.S., taking just $607 (£397) in its opening weekend,” while The Guardian’s tongue-in-cheek comment said that “as proof of corporate insanity it is a valuable case study.” The film opened last Friday on just 10 screens and The Hollywood Reporter reported that the FilmBar cinema in Phoenix took in just $9, meaning that only one person bought a ticket. Apparently, even those who bought a ticket didn’t enjoy it. With an estimated budget at between $25-32 million, it’s said that FIFA put up approximately three-quarters of the money. The project was completed before corruption charges were filed against 14 FIFA officials in May. Blackhawks bring home Stanley Cup … again!